NASA’s Mars rover Curiosity just might be the latest in a long line of Mars-exploring robots to discover the building blocks for primitive life on the Red Planet. The Curiosity rover may have gathered evidence for the presence of perchlorates in Rocknest – a sand patch inside the rover’s Gale Crater landing site on the Red Planet, scientists say. If so, it shores up the case that the material may well be globally distributed on Mars. Not only can perchlorates, which are a class of salts, serve as an energy source for potential Martian microorganisms, they are also a sensitive marker of past climate and can lead to the formation of liquid brines under current conditions on the planet. Archer pointed to the rover’s Sample Analysis at Mars (SAM) instrument suite that recently ran four samples from Rocknest. That area was selected as the source of the first samples analyzed because it is representative of both windblown material in the Gale Crater and the planet’s globally distributed dust, he said. “When we heated this up, we saw a large oxygen release at the same time we saw the release of these chlorinated hydrocarbons,” Archer said, thus making a strong case for the presence of perchlorate salts in Rocknest’s soil. Perchlorates were first identified on Mars in the polar region by the Wet Chemistry Laboratory on NASA’s Phoenix lander in 2008. This detection of perchlorates was corroborated by an oxygen release observed by the polar lander’s Thermal and Evolved Gas Analyzer instrument during analysis of a soil sample similar to the oxygen released from Rocknest samples, Archer said. Archer reported that the prospect of perchlorates in Rocknest material adds weight to the argument that both Viking landers in 1976 measured signatures of perchlorates, in the form of chlorinated hydrocarbons. 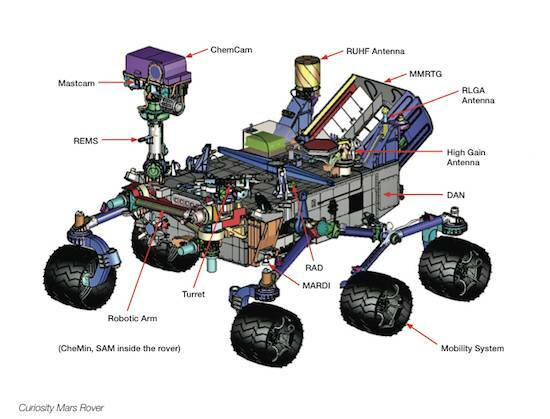 Similarly, Archer noted that other Mars robots – Sojourner, Spirit and Opportunity – also detected elemental chlorine. Moreover, orbital measurements by the Gamma Ray Spectrometer on the Mars Odyssey spacecraft show that chlorine is globally distributed at similar levels. The Curiosity rover may have gathered evidence for the presence of perchlorates in Rocknest – a sand patch inside the rover’s Gale Crater landing site on the Red Planet, scientists say. If so, it shores up the case that the material may well be globally distributed on Mars.NASA’s Mars rover Curiosity just might be the latest in a long line of Mars-exploring robots to discover the building blocks for primitive life on the Red Planet. Archer said that the implications of globally distributed perchlorates are very important for climate, habitability and present-day aqueous processes. Specifically, perchlorate has important implications for Mars habitability. “The perchlorate story keeps growing in importance since its discovery by the Phoenix mission in May 2008 and is changing the way that we conceive Mars,” said Peter Smith, the Phoenix principal investigator of the University of Arizona in Tucson. The Phoenix lander spent a multi-month tenure digging up samples of Martian dirt and subsurface water ice, analyzing them for signs of the planet’s past potential habitability. Smith said that perchlorate is apparently omnipresent at about 0.5 percent and is poisonous, making human missions to Mars even more hazardous. “Seasonal flow features may be caused by high concentration of the brines of perchlorate, which has a strong attraction to water and can drastically lower its freezing point,” Smith told SPACE.com. “The soil perchlorate may have caused a false negative for the Viking experiment combusting organics with its release of oxygen above 200 degrees [Celsius]. And finally, perchlorate is an energy source for microbes on the Earth and perhaps serves that purpose on Mars as well,” Smith said. NASA’s $2.5 billion Mars rover Curiosity landed on Mars in August 2012 to begin a two-year primary mission aimed at determining whether the Red Planet could have ever supported microbial life. On March 12, NASA announced that Curiosity did indeed find proof that Mars was once habitable for primitive life in the ancient past. The announcement came from a detailed analysis by Curiosity of a rock sample drilled out of a Martian rock at a different science target - a rock called John Klein. Curiosity is yet to do much more wonders on Mars.